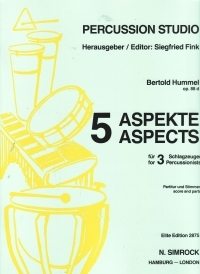 The Five Aspects for Percussionists Opus 88d was written for an international competition for this instrumentation in Luxembourg (1991). The tonescape of the first movement centres on mallet instruments and metal idiophones. Expanses of sound constantly alternate with broken structures. The comparison with contrasting colours is unavoidable. The second movement is devoted to membrane instruments; short signals, sometimes set as a canon, dominate the extremely terse movement. The third movement - a "quasi Notturno" - omits die membrane instruments like the first. The fourth movement combines the mallet instruments of xylophone, vibraphone and marimba in mixtures. The melodic intervals of minor third and tritone are characteristic of this again very brief "aspect". The somewhat more generously planned fifth movement combines passages recalling recitative with chorale-like episodes. A stretta of the membrane and metal instruments brings the work to an unexpectedly turbulent close. A medium-difficult multipercussion trio in five movements. Prolog is scored for xylophone, vibe and marimba, along with several standard metallic and wooden instruments. Many double stops (Struck and roiled) are used but present few problems at a tempo of quarter =60. Toccata is scored for three drums and uses unison writing, some hocketing and some interesting (rhythmically) canonic writing. Many sixteenth-notes in a tempo of quarter =138 demand very accurate timing for clarity. Notturno is slower (quarter=54) and again uses the three keyboard instruments, along with various suspended cymbals. Some 3-mallet playing is required on the vibe and marimba. The use of thirty-second-notes (written as double-stroked sixteenths) may present some problems in evenness of sound. Mixtur is quite fast (quarter=176) and is a rhythmic unison among llie three keyboard instruments. The "harmonic" content throughout consists of two simultaneous whole steps (e.g., Bb/C/D; F/G/ A; etc.) Changing meters, rests and rapid or wide dynamic changes contribute to the challenge of this move¬ment. Epilog is scored for almost the entire complement of instruments, but again relies heavily on the keyboard instruments. More rhythmic complexity is present; meters and tempi change at times; and the vibe has several "senza misura" cadenzalike sections. The score seems a little cluttered, but the parts are extremely easy to read—matte-finish puper; black ink; large print; very clear dynamics, mallet indications, performance instructions, page turns planned.